Lessons, lessons and more lessons. Miko hates lessons, but when he is chosen by Ki-Yaga's former teacher, Pak Cho, as an apprentice he is taught the value of another skill. The Little Cockroaches and their teacher are travelling to Daeheon City to deliver a message from the secret training camp of the Hwarang warriors. But when the samurai kids are caught in the middle of much unrest in the Nine Valleys, they quickly learn that old ways must embrace new. Sandy Fussell lives south of Sydney with her husband and two sons. She studied mathematics at university, is intensely interested in history, and now works in IT. Her series, Samurai Kids has been hugely successful with Book 3, Shaolin Tiger named as a Notable Book, Younger Readers Category in the Children's Book Council of Australia Awards, 2010 as well as being short-listed in the Speech Pathology Awards - Upper Primary Category, 2010.. Polar Boy, her first stand-alone novel was short-listed in 2009 for the Children's Book Council of Australia Book of the Year for Younger Readers, and her second stand-alone novel, Jaguar Warrior was released in March 2010. Rhian Nest James has been working as a freelance illustrator for many years after graduating from Exeter College of Art with an Honours Degree in Illustration. She has produced illustrations for a wide variety of publishers and organisations but her speciality is children's books, having illustrated over 60 children's books and contributed illustrations to many more. Rhian moved to Sydney from her native Wales in 2002 and she continues to illustrate for others and work on her own projects. 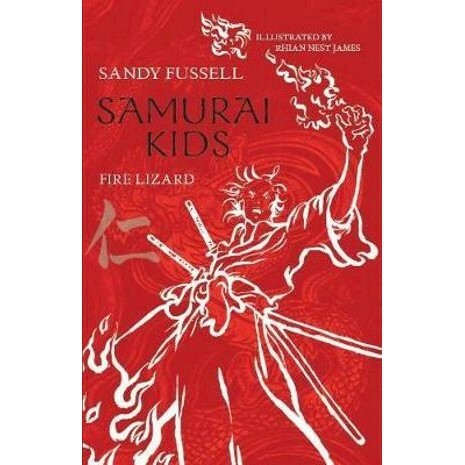 She is the illustrator of the best-selling Samurai Kids series (written by Sandy Fussell) and has recently illustrated the award-winning fiction title Toppling written by Sally Murphy.